Things are looking up! Last week I came into the office and actually worked a minimum of 2 hours a day, and usually more like 3 or 4, on The Other Side of the Sky! For 6 days in a row! Okay, so maybe my use of the word “work” might be giving you the wrong idea. The first few days I came in and wrote in my writing log, walked laps around the house, walked laps around the yard, lay on the bed and thought, did nonstops and all too often caved to my desire to read the news, which after all, is only a click away. But each time I fell into that made me more desirous of not doing it again. I also made a point of closing down the computer around 9pm and getting to bed earlier. Not being sleep deprived helps tremendously in being able to control one’s sudden impulses to do other than what one has decided to do for the moment. And after a week I have learned that it really is true: I can not do as much as I wanted and thought I could. But I am liking that. I am feeling uncluttered. More able to breathe. More focused on the work. 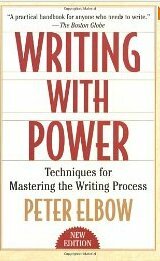 Last week, Tuesday, actually, sometime around the end of my daily work period, I opened one of the books I keep on my shelf, that I have referred to often during the course of my writing “career.” That book is Writing with Power by Peter Elbow. I have a paper on doing “Open-Ended Writing,” one I prepared from concepts taught in this book, and I had been trying to do some, but they didn’t seem to be working out. So I decided to look up Elbow’s original writing on the matter. The open-ended writing process… is a way to bring to birth an unknown, unthought-of piece of writing — a piece of writing that is not yet in you. It is a technique for thinking, seeing, and feeling new things. This process invites maximum chaos and disorientation. You have to be willing to nurse something through many stages over a long period of time and put up with not knowing where you are going. Thus it is a process that can change you, not just your words. This blew me away when I read it. For two reasons, one, because it’s exactly what I’ve been experiencing… chaos, disorientation, taking a long time, not knowing where you are going… YES! That’s exactly what it’s been like. I have hit a wall because I am trying to take the story someplace it’s not supposed to go. I know that sounds weird and esoteric, but it’s the only way I can describe it. It’s happened before. Years back in writing The Light of Eidon, I wanted there to be a fire in Southdock. Abramm was supposed to run in there and help put the fire out as I recall. I couldn’t get myself to write it. Kept trying. Even forced myself to write it until I couldn’t stand it any more…. And then I realized that I was trying to take the story in a place it wasn’t supposed to go. I backed up, rethought and came up with a new line that worked perfectly. Later, there actually was a fire in Southdock… I think that was in book 3, Shadow Over Kiriath. But even in that book Abramm was not involved in fighting the fire, it was just one of those things you want to “have happened” but not that you want your protagonists involved in. Anyway, I think something like that is happening now. It may not be as major of a course correction as “don’t have that scene at all” but it’s set me on a new line of thinking. One that has suggested perhaps I need to change the whole world as I’ve developed it. Because that never works. I need the world and the characters and the doctrinal analogy and the plot all to come together and I have never been able to do that by taking one part of the story and developing it rigidly and then heading on to the others. Just. Can’t. Do it. The biggest problem I have with all this is that I keep forgetting that. Keep wanting to take control and try to get my mind around at least one piece so I can develop that, and have at least SOMETHING that won’t change when I think about it. And that’s not what God would have me do. YES! This is what I’ve been doing! Haltingly, reluctantly. Thinking I’m failing instead of S-L-O-W-L-Y progressing. All these whirling ideas, things that appear in my head but I can’t see how they fit into the whole… It frustrates me, and yet it’s exactly the work I’m to be doing. It’s the same process Pastor John’s been teaching in the spiritual life. I have all these papers and cards with notes on them, these half-formed ideas regarding the world and as I’ve encountered before, I can’t just start deciding stuff because it’s not linear, it’s holistic. It comes together all at once seemingly out of nowhere, not piece by piece. This is kind of how the spiritual life goes as well, the chaos, the blindness, not knowing, the crazy stuff and where is God… and all the while, like in the Artistic Coma, He’s there, beneath it all, inside, so deep we can’t see it, can’t feel it, can’t even tell, but He’s working on us. It’s weird the way all this fits together for me… But that’s gotta be Him as well. This entry was posted in Christian Life, Creativity, writing life and tagged nonstops, Open Ended Writing, Peter Elbow, writing books, Writing with Power on November 18, 2012 by Karen Hancock.